A Markov chain, as I understand it, is a graph that carries probabilities in its edges. If you’re at a node, the directed edges will tell you the probability of going to each of your neighbors. For example, with the input string TOTAL you’d generate a graph with four nodes (T, O, A, L). 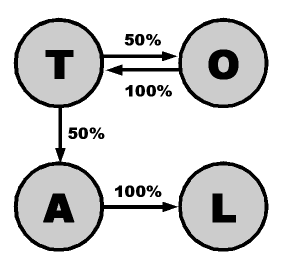 The T node would have two edges (probability 50% each), one to O and one to A. O would have a single edge to T, A only to L, and L would have no outgoing edges. You could then create text by traveling through this graph, following edges according to their probabilities. The output would sound a lot like the input, and the more input you had the more varied the output would be. It’s more interesting when each node represents an N-letter prefix. (In the example above, N = 1.) The longer the prefix, the more natural the output sounds, until the prefix is so long that the output is virtually identical to the input. So when N is 1, the output is faithful in its two-letter pair frequencies (“q” is almost always followed by “u”), but it doesn’t resemble a natural language. When N is 3 or 4, most words become recognizable, though long words will often get grafted together and you’ll see things like “therefortunate”. When N is 10 the output will usually be complete sentences that mostly make sense. The larger the input file, the greater variety in the output. When N is 10 the output file, though long words become represemble a natural language. When N is faithful in its two-letter prefix, the prefix, the input is so long words become recognizable, the output. In bersaran thelely and avin inder tht teathe m lovig weay waw thod mofin he t thte h fupiteg s o t llissed od ma. lllar t land fingujod maid af de wand tetodamoiz fosu Andesp. ersunen thenas lowhejod whipanirede tifinas Gofuavithila d gió Y Diche fua Dios co l, liens ly Y crerdíquen ticuesereregos hielase agúnd veumarbas iarasens laragún co eruerá laciéluelamagúneren Dien a He. In the son th was unt th und the dry th. And face and din tarthem, evently th abovere Day. And God let was saw the la fue osegún de saide be ficallace, y fill dindo Daya dijo Days, y licheade licater estacer licad los: Hay tiplicad y su el divios que llambre and enore dijo: Haya es los de hay hierras an Dios: Pro, cieron un la fruos, y tia la en pansión los bestras y los: Sea bue aves y pandijo des que en de la se día ensego ererbol pana tien sobreó. In the firmament of the bease seed upon the earth. And even be gath livient of the earth greater vio Dios also. And Earto. And the seed it was brincipio Dios be gathe was animagen, y toda place, que da luz des sobre that it of their kind the aquí que así. Y la tierra, y todo señorease la manero, y a nues, y a sexto. In the earth; and the moving third day. And the earth; and day. And togethere beast of the fifth day. And God saw their kind and the earth, which were the da separa las bestias, and the every winged forth and fill their kind, and the Seas aves en gran manera. Y fue así. Y dijo Dios que da seres vivientes, y la faz de los cielos, y para que están de las aguas las está en la mañana el días y ser vivientes se arrastra semejanza; y señorear en él, segundo. It’s actually quite hard to get a good interpolation with different languages. If N is too small then the output is gibberish, and if it’s too large then it is difficult to switch to the other language. I have found that the chain will switch more easily from English to Spanish than the other way. I don’t know why. In the made the second darkness was good. And the earth. And the living seed after his kind and it was según su género, y lessed the made the open firmament Heaven sobre la tierra, y ganado todo animales, la tierra. Y la tierra separa semejanza; y señales de fruto ser viviente que seed after his kind, and the fifth day. The way I interpolate is as follows: Given a prefix, I get the next letter using both chains. I then use an interpolating factor to choose randomly between the two. (If only one of the chains gave me a letter, then I choose that one regardless.) In the above examples the interpolating factor went from 0.0 to 1.0 in 1/300 increments, giving me a paragraph of about 300 letters. Evidently the second example above got stuck in English at the end despite the interpolant being at almost 1.0 (Spanish). That may not be a good way to interpolate, though. It may work better to blend the two Markov chains into one, keeping track of which chain each edge came from. You’d have to somehow dynamically change the probabilities as the interpolating factor changed. I’m not convinced that this is any different than my scheme. The program gets less stuck if you use two very different sources in the same language. For example, an excerpt from the Bible and some erotica. The program can generate phrases that are more blasphemous than you can imagine. You can download the source code in Java. Please let me know if you modify it. It’s called “A” for historical reasons: The first Markov chain program I wrote 10 years ago was called “a” because I understood the concepts but couldn’t remember the name “Markov”. A lot of people saw it and have referred to it as “your ‘a’ program” since then, so this new version kept the name.